If you haven't previously connected your MailChimp account to RiderHQ you will see a link to do that now - once that's done, continue with the step above (you only need to do the connecting once). We'll send over all your entrant email addresses (or if you've published before, just the ones that have changed or been added since your last publish). We'll also set up a 'segment' named after the event from with you published and add all the published emails to it, so you can control which events you send emails to. Occasionally you might want to sync an event-segment manually: for example, if you already have entrants of your events on your MailChimp list (perhaps you uploaded them manually), and you just want to be able to tell which ones entered which events in MailChimp; or perhaps you published some entrants and after waiting for MailChimp to carry out their opt-in confirmation you now want to ensure that they are all in that event's 'segment'. 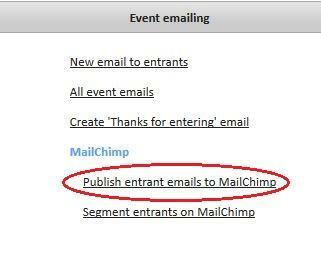 To do this, select 'Segment entrants on MailChimp' from the emails popup above. You can run the 'Segement entrants' whenever you want (e.g. 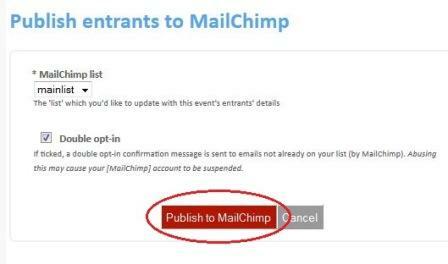 before you send out an email to entrants from MailChimp) it will simply ensure that all entrants of your event who are on your MailChimp list are in the event's segment (we auto-create a segment for the event if we haven't done so already). 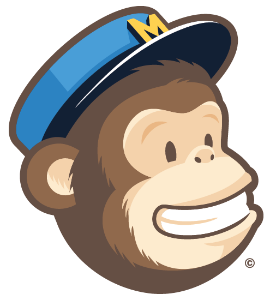 That's it - hopefully you find this useful, and it saves you a bit of time - let us know if you'd like to see any other MailChimp features!